Hello, guys, it is time to point out you the new technology, the technical content of H.265 was settled on January 25, 2013, while the specification was formally approved as a standard on April 13, 2013. This year, Apple applied next-generation H.265 technology to its new iPhone 6 and larger iPhone 6 Plus for FaceTime over cellular. In general, H.265 has several big advantages over H.264, including better compression, delicate image and bandwidth saving. Simply put, H.265 is the codec of the future. Then you may ask is it possible to rip a DVD in the new H.265 Codec for better visual effects? Yeah, there are many available DVD rippers for AVC/H.264 in the market, however, when talking about DVD to H.265 rippers, the latest version of Pavtube DVDAid is suggested by many users. It is the qualified DVD ripper I’d love to have. Equipped with H.265 Encoder, this upgraded top DVD to H.265 ripper enables you to convert favorite DVD movies to MP4 H.265 to release your disc space and let you enjoy the higher DVD videos. In addition, you can also convert your DVD to other common video files with several mouse clicks. It completely fits the words in ads, easy to use, blazing fast speed and high quality. How to Convert DVD to H.265/HEVC MP4 on Windows 8.1/8? Step 1: Run Pavtube DVDAid, then its main interface will pop up. Click Disc icon button to upload your DVD movie content to ripper. Step 2: Let’s click the drop-down-list besides “Format” and choose “Common Video> H.265 Video(*.mp4)”. Step 3: Click “Settings” to enter Profile Settings window, you can find settings for video size, codec, bitrate and frame rate. Step 4: After you process all the steps above and right click “Convert” to begin your DVD to H.265/HEVC conversion. Pavtube DVDAid is the Top-ranked DVD to H.265 ripper tool. Now download it to rip and convert DVD to H.265 for playback on media players and 4K TV. To deal with a H.264 video, just prepare an all-in-one H.265 encoder, decoder and converter in hand. Tip 1 : Except for the options of H.265, you can choose other H.264 options from “Common Video” option, that means you can rip your DVD video into baseline profile, main profile and high profile H.264 video. Tip 2: High codec like H.265/HEVC, or H.264 high profile of course will output much sharper video quality, but the conversion time will also much longer than other common codec. 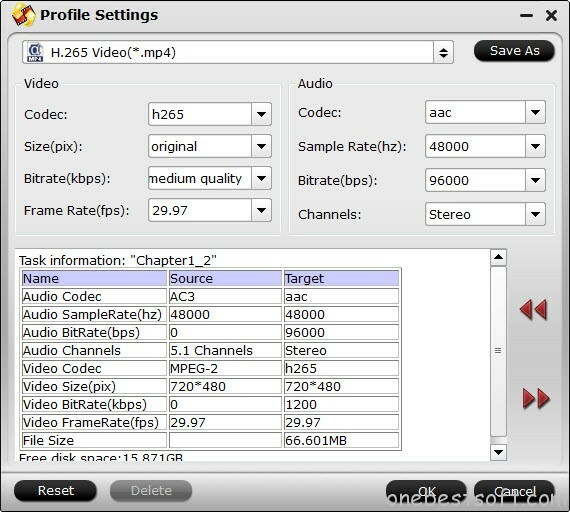 Tip 3: You can select the GPU Decode Acceleration by clicking “Tool”>”Option”>”Acceleration” , it is activated when encoding DVD to H.264 video files as baseline profile.